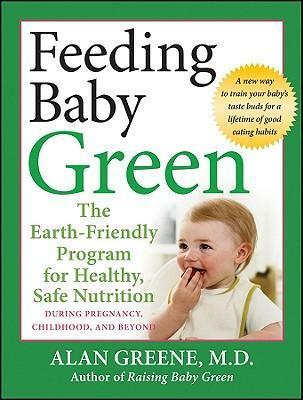 The new “baby feeding bible” from the award-wining author of Raising Baby Green Called the “Al Gore of Parenting” by Parenting Magazine, Dr. Alan Greene has written the follow up to his best-selling book and offers parents a definitive guide for making nutritionally-sound decisions for their children. Offers parents green choices for feeding children from when they are in the womb through toddler years. This unique guide includes advice on how to transform a baby’s eating habits that will positively impact their health and development for the rest of their lives. Dr. Greene has included everything a parent needs to know about creating healthy, nutritious meals that help avoid childhood obesity, and prevent childhood disease. This must-have resource Shows how what a mother eats during pregnancy effects her baby’s health and eating habits for years after birth Provides the definitive guide to “green” feeding for babies from pregnancy to toddlers Filled with practical tips and advice for selecting and preparing earth friendly meals for babies Shows the health benefits for babies who eat “green” with innate nutritional intelligence The crucial follow-up to the best-selling book Raising Baby Green In addition to working in his medical practice, Dr. Alan Greene makes regular appearances on the Today show and writes articles for the New York Times.